Want a weekend in the mountains but don’t have the time? Then spend a summer evening in Golden. Located just 12 miles from downtown Denver, Historic Golden has all the amenities, views and feel of a mountain town, without the drive or traffic. From the hanging flower baskets and public gardens to the historic Old West architecture and welcome arch, Golden feels like the mountain west. And summer weekends in Golden are the best time to visit. On Friday and Saturday evenings, most of the downtown shops stay open until 8 p.m., there are free horse-drawn carriage rides, live music, free parking and more than a dozen pet-friendly outdoor cafes and beer gardens. LATE EVENING SHOPPING. On Fridays and Saturdays from June 1st to Aug. 31st, most of the shops on and near Washington Ave (Golden’s main street) will stay open until 8 p.m. You can shop in clothing boutiques, art galleries, jewelry stores, toy stores, fly fishing shops, outdoor gear stores, pet stores, and furnishing shops, all in a small-town-America atmosphere. FREE PARKING. Golden offers hundreds of free two-hour parking spots at any time, but all parking in Golden is free after 5:00 p.m.
FREE CARRIAGE RIDES. Free horse-drawn carriage rides will be offered from 5 to 8 p.m. on Friday and Saturday evenings, from June 1st to August 31st. Two gorgeous horse-drawn carriages will clip-clop down the historic backstreets of Golden, passing by quaint Victorian homes and gardens with gorgeous views of Lookout Mountain and North and South Table Mountains in the distance. BROWSE THE GALLERIES. Stores and galleries will feature wine and art events and meet and greets with local and national artists. CREEKSIDE WALKS. 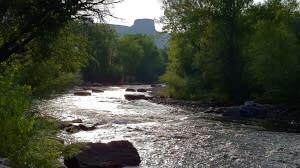 The two-mile paved walking path beside Clear Creek through the heart of downtown Golden has been called the most beautiful trail in Metro Denver. The nearly level trail follows the creek up into the foothills and is easily accessible for handicapped and baby carriage visitors and is pet-friendly for dogs on a leash. In the afternoon and early evening, the creek is packed with kayakers and tubers, while overhead, hang-gliders fill the sky circling down on air drafts from the top of Mount Zion. The Clear Creek path is a lively and colorful place, but so quiet, you can always hear the river rushing beside you. FREE LIVE MUSIC. Buskers and musicians can be found on Golden street corners on Friday and Saturday evenings, playing for tips and adding music to the air. BEER GARDENS. Golden brews more beer than any town in America. 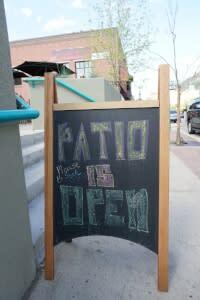 Much of that is due to Coors (the largest single brewing site in the world) but Golden also has numerous beer gardens, breweries and distilleries. 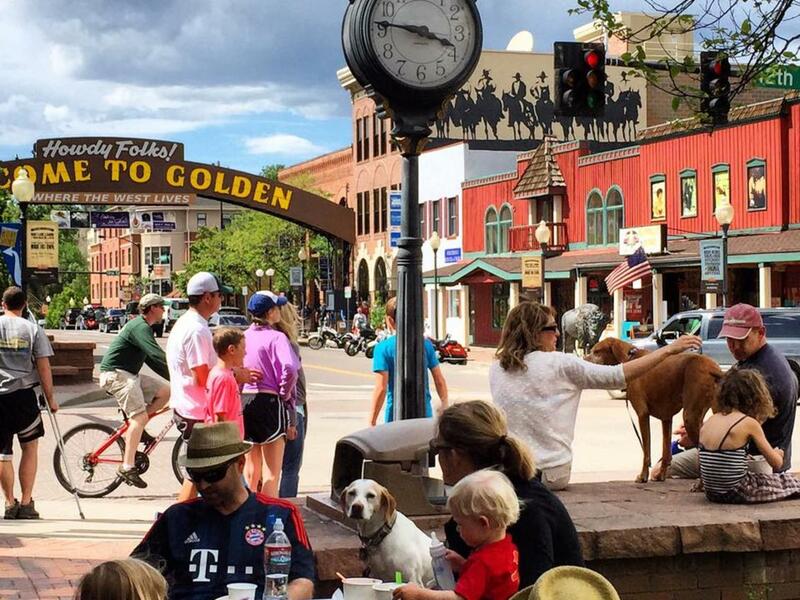 The people in Golden love to live outside, and all the beer gardens and many of the restaurants are pet friendly and welcome your four-legged friends with water and treats. OUTDOOR CAFES. Outdoor cafes offer a wide choice of specialties. Start your morning sitting creekside at Sassafras for a Cajun Bloody Mary and Elvis French Toast. For lunch, grab a to-go sandwich from D’Deli (known for their Colorado Buffalo Ruben or cold elk meat subs) and have a picnic along Clear Creek. Or head to Colorado’s first state capitol building, the Old Capitol Grill & Smokehouse, where the patio is now ground central on Washington St. for people watching. For dinner, families love Woody’s Wood-Fired Pizza is a longtime Golden tradition. You can get a taste of the Southwest at Table Mountain Inn & Cantina’s flower-covered outdoor patio, or a taste of Nepal at The Sherpa House, where their amazing tiered, tree-shaded outdoor patio has views of South Table Mountain. HISTORIC WALKING TRAILS. Golden was the first capital of the Colorado Territory and one of the state’s earliest towns. You can download a historic walking tour at www.goldenhistory.org/learn-do/walkingtour/ and follow the exciting days of Golden when it was a gold rush boom town. Generals Grant and Sherman once stayed here, and you’ll be amazed at some of the rich historic buildings within a few blocks of main street. Bring some quarters and on the south side of the Clear Creek, you can feed the exotic, rare chickens kept in the historic chicken coop as part of the Golden History Museum. MOUNTAIN VIEWS. Golden is where the plains meet the mountains, but because of two huge 70-million-year-old volcanic buttes, Golden lies in Clear Creek Valley, surrounded on all sides by towering peaks. It’s a short (but steep) hike up South Table Mountain at twilight to watch the lights come on in the village below. You can drive up Lookout Mountain for incredible views of the entire eastern plains and all of Metro Denver (but be careful driving up and down on this unlighted stretch of twisting road). Trails also lead up Mount Zion, North Table Mountain and Mount Galbraith, all of which offer spectacular views over the town at twilight and are perfect for a late afternoon summer walk before stopping at a downtown beer garden or café for dinner. RED ROCKS CONCERTS AND FILMS. Golden is just a few minutes’ drive from Red Rocks Amphitheatre and is the location of the new Origin Hotel, the “official hotel of Red Rocks.” Nothing can compliment a concert or film at Red Rocks more than an early dinner and walk in Golden, where you can dine outside with nearly the same mountain view that Red Rocks offers and be in the concert parking lot in just a few minutes. All year long, Golden is your go-to mountain town without the drive. For more information, head to visitgolden.com.